I'm so excited. I have my first finish for the year in the One Project A Month Challange. I had done some of the quilting on it and then it sat around for several days because I couldn't think how to quilt the rest. I had to do a customer quilt so that meant I had to get this off the machine. So thought I would do the border and then take it off. Then thought "Just get it DONE". Suddenly inspiration hit and it was quilted. It's not the best quilting job in the world but it won't be going on display, or in any competition and ave I said it - IT'S FINISHED. But I must say I like the effect around the nine patches. The quilting around the nine patches gives it movement. It looks great! Oh........How lovely. Isn't a finish a wonderful thing. Did you you free motion quilt it? Love the way is looks. Thanks for visiting and oh, I love your 9-patch! 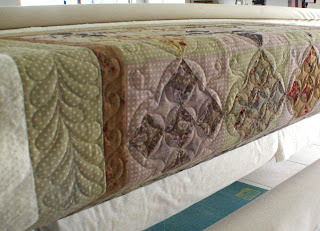 Maggie your quilt looks lovely and I love the pinwheel quilt, love pinwheels! Your SBS in repros looks really good, I decided on the florals for mine as I thought it would be enough already doing DJ in the repros so I thought it would be something different just to break things up. I am using a mixture of antique florals and old Robyn Pandolph ranges. I am happy with how it's turning out so far but I have heaps of blocks to go!! 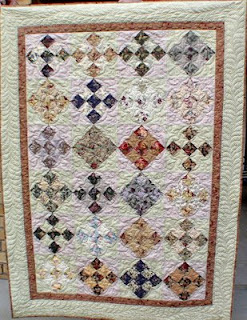 Lovely Quilt...Love the Quilting on the borders...see you Tuesday...if you are coming.